Setting up a workspace structure that models your workflow is key to making your team successful in LiquidPlanner. Before you do so, make sure you’ve got a handle on LiquidPlanner’s best case / worst case scheduling approach. Below are some guidelines for building out your structure, but remember, you can always customize and change things up as your team and business evolve. Packages help you organize your projects and prioritize tasks from different projects that are running at the same time. The order of your packages influences how your projects and tasks are scheduled, so it’s important to consider your package structure. The Status Model is the most common package configuration because it provides quick visibility into active vs. pending projects. 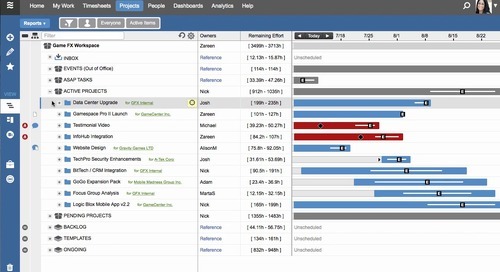 This model also naturally reinforces listing projects in priority order from top-to-bottom, which is a key aspect of LiquidPlanner’s priority-based scheduling methodology. The Inbox is at the top of every workspace and can be used as part of your project intake process. Items in the Inbox are unscheduled, so you can build out new tasks that need review prior to being scheduled and prioritized in your plan. Keep the events your team is using to block time out of the schedule for meetings, holidays, and vacations in this package. Unlike tasks, events will always be scheduled for the date and time that you set, regardless of where they’re placed in the plan hierarchy. We recommend keeping PTO grouped together in the Events package so it’s easy to see who is out of the office. LiquidPlanner’s priority-based scheduling methodology will schedule your tasks in order from top to bottom by default, but sometimes tasks from projects listed lower in the workspace will need to be done before tasks listed higher up in the workspace. Use the ASAP package to manage your to-do list. Package up tasks from multiple concurrent projects to schedule them in the order they need to be completed. Keep the projects your team is actively working on in a package called “Active Projects”. Be sure to list them in priority order so LiquidPlanner schedules them accordingly. This is where you’ll keep any projects that are not actively being worked on. You can rename this to “Backlog”, “Planned”, “Awaiting Approval”, or another name to indicate that work has not yet started on these projects. Projects in this backlog package are on hold and are not affecting your schedule. If you have projects with the same tasks and phases, create a template version of those projects and keep them in the Templates package. 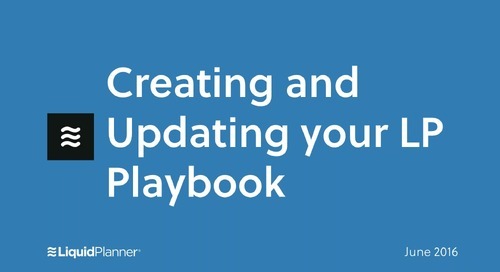 When a new project is approved, just duplicate the template, drag and drop it to the appropriate place in the plan. If you’re an Agile team, you can configure your workspace using our sprint package structure. Get the most out of our filtering and reporting features by using blue project folders to represent projects in LiquidPlanner. Use grey sub-folders to represent phases of a project. Avoid nesting too many layers of sub-folders inside projects as it can make your workspace harder to navigate. Before adding a layer of sub-folders, consider whether that categorization can be achieved using custom fields instead. 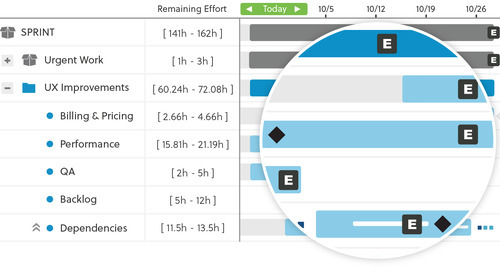 Tasks are the most basic building blocks in LiquidPlanner and are critical components driving the project schedule. Tasks are used to both track the amount of work remaining and the amount of work already completed on your projects. Each task is estimated with a ranged effort estimate representing the amount of work required to complete the task. Workspace members responsible for completing the work are assigned as owners on the task and track time to record the progress made on their work. Entering remaining effort estimates and tracking time to tasks are both imperative to keeping your schedule accurate and up to date. Tasks can be added to projects, sub-folders, packages or the Inbox. Custom fields contain custom values that provide more context to your plan items. It’s possible to filter and report by custom field values as well. Custom field types include Pick List, Text, Date, Numeric and Currency. These fields are available at the project and task level. Tags also help you categorize, filter, and report on your work, and allow you to associate multiple values to the same item. Tags can be added to any plan item and tags added to a container will be inherited by the items within the container. “Client-facing” – tag items with “client-facing” so you can filter your Analytics reports and Dashboard widgets to only items you want to share with the client. If you work on projects for clients (whether internal or external), set them up as Clients in LiquidPlanner. Using clients allows you to associate your projects to clients, and then filter and report by client. Take it a step further by setting up activities and rate rules so that you can report on billable and non-billable hours for each of your clients. Create teams and assign each of your workspace members to their respective team. This feature allows you to send comments to entire teams, block out time for team meetings, and filter and report by team. For example, a software company might set up teams for Development, QA, and Support. Marketing firms might set up teams for Graphic Designers, Web Designers, and Copy Writers. The post Setting Up the Workspace appeared first on LiquidPlanner.